Hymn pollsters report that "The Old Rugged Cross" is the most frequently requested hymn; and songbook editors have designated it as the most popular of all twentieth-century religious songs. Within thirty years of its initial publication in 1913, more than twenty million copies of "The Old Rugged Cross" had been sold, outselling every other musical composition of any kind published to that date! What is it that makes this gospel song so popular? It has been speculated that the author and composer of this hymn, George Bennard, was a clever hymn writer who knew the tricks of wedding a swinging melody, a good chorus, and easily memorized words. Others who have tried to evaluate the reasons for the hymn's popularity say it grabs the heart of the singer with raw emotionalism. Still others claim its success lies in the presentation of the truth of the Gospel story in terms every believer can appreciate, bringing firm reality to the theological doctrines regarding the cross of Christ. For the author, however, the hymn was not written to become a great success, but in answer to a deep personal need in his own life. And perhaps that is the reason it has meant so much through the years to others, as they feel it meets a deep need in their lives, too. Born in Youngstown, Ohio, on February 4, 1873, George Bennard was raised in a loving family, the only son among four daughters. While he was still quite young, the family moved to Lucas, Iowa. It was here, whle attending a revival meeting sponsored by the Salvaton Army, that Bennard made a personal commitment to follow Christ. When George was only sixteeen years old, his father died, and he assumed the responsibilty of providing for his mother and four sisters. When his family responsibilities lessened, Bennard joined the Salvation Army, where he initially served alone and then, after his marriage, with his wife. Both Bennard and his wife were officers with the Salvation Arnmy until he felt the call to move on into a different area of ministry. Resigning his position with the Salvation Arnmy, he became a traveling evangelist for the Methodist church. As such he conducted revival campaigns in Canada and in the northern and central United States. One time, after an specially difficult experience in a New York campaign, Bennard returned to his home in Michigan. 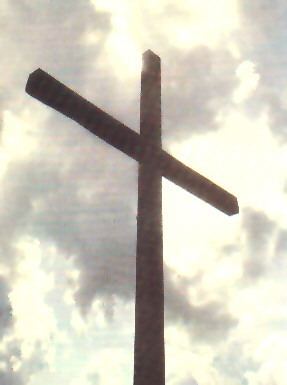 There he reflected on the meaning of the cross in the life of a believer, especially in light of the Bible passage from Galatians 6:14 in which the Apostle Paul states: "May I never boast except in the cross of our Lord Jesus Christ, through which the world has been crucified to me, and I to the world." Cconsidering these words, Bennard became convinced that the cross was not merely a symbol of Christianity, but the very heart of it. In his writings, Bennard reports that as he meditated upon this, the words, "the old rugged cross," came into his mind and then the notes of a melody ran through his head. Quickly, he wrote them down and then tried for several weeks to compose words to fit the tune. Finally, after a period of prayer, the poetry of the verses began to flow from his pen almost unbidden. After completing the four verses of the hymn and the chorus, Bennard took the hymn to the home of some friends, the Reverend and Mrs. L.O. Bostwick, and sang if for them. He concluded his presentation with the question, "Will it do?" The Bostwicks were so enthusiastic about the hymn that they offered to pay the fees to have it printed. Consequently, "The Old Rugged Cross" was published for the first time in 1915, and has been met with enthusiasm from that day to this. After writing this hymn, George Bennard went on to travel and preach for another forty years. Although he composed several other hymns, none was to become as popular as his first. In 1958, at the age of eighty-five, he "exchanged his cross for a crown." George Bennard was honored in his hometown of Reed City, Michigan. Near the house where he died, the city officials erected a wooded cross that stands twelve feet high. On it is a plaque that reads: " 'The Old Rugged Cross'--Home of George Bennard, composer of the beloved hymn." Taken from HYMNS OF FAITH & INSPIRATION, Ideals Publications Incorporated, Nashville, Tennessee, 1990, pgs 88-91.